Olympia City is a shopping center, a 500-rooms hotel, commercial facilities, shop-houses, restaurants, apartments, business center, financial street and more than 3,000 cars parking area. And also the project stretches on 3.9 hectares of landmass north of the national Olympic stadium was started in 2012. Moreover, the project is forecasted to complete in 2019? 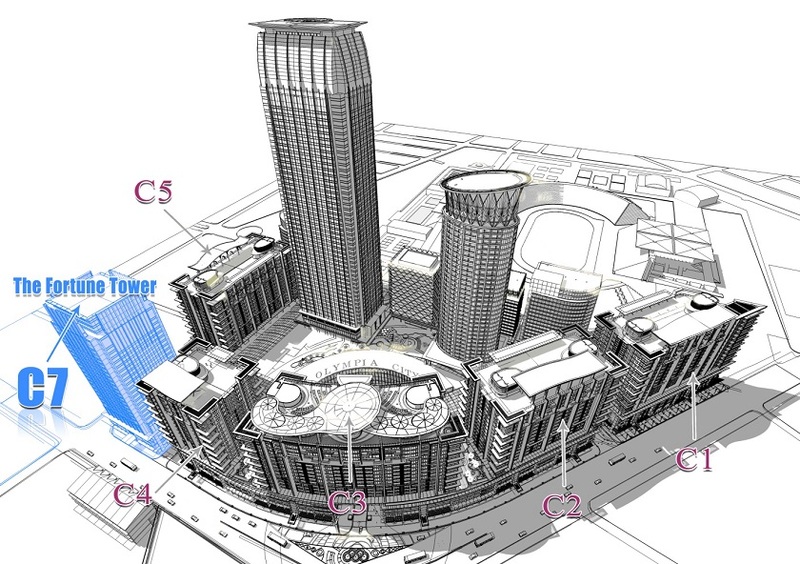 This massive city project features skyscrapers including a 55-story building, five 20 stories buildings and a 25 stories building, as well as a modern supermarket. Olympia City is well known as the mix-used development by Cambodian property award which developed by OCIC of Canadia group. C1 and C2 have been ready to hand-over and move in. C3 and C4 have been planned to finish by end of 2017. C7 have been finished the working with foundation and basement parking, growing up to the top by end of 2018. C1 -The Forest Condominium: 401 units, 20 floors. C2 -The River Condominium: 372 units, 20 floors. C3 -The Sun Condominium: 515 units, 23 floors ( include sky bar 3 floors). C4 -The Light Condominium: 300 units 20 floors. C7 -The Fortune Tower: 276 units 25 floors (SOHO & Office). C5- The Earth Condominium: ????? units Coming soon. Each condominium exists with 20-floor height, providing full facilities with the fitness center on 5th floor of the whole building such as Gym, 3 Swimming pools, Steam & Sauna, restaurant, small store …. etc. Each unit has been equipped with security systems such as Fire alarm, Smoke Detector, and Sprinkler. Video Door Phone, new technology system, has been installed in each unit. Residents should easily check their own visitor and make a call to security guard 24/7 for any emergency case in the building. There are more restaurants set up and the sky bar on the top roof of building as well and walking closely to financial street center with 4 floors shop-house and Shopping Center. There are 24/7 security guards at all main entrance and others necessary location. Residents also could contact the hotline customer service center, provided fully supported and assist from Olympia City Management Office. Car parking space with 2 basement underground provided up to 3,000 units. Residents feel no worry about parking their vehicle at all. The northeast part of Olympic National Stadium, along the Monireth Blvd (str.217) and Typhoon Blvd (str.182) and corner Street 161, Sangkat Vealvong, Khan 7Makara, Phnom Penh, Cambodia. High standard of living and civilization situated in the heart of Phnom Penh City. Located in the major business zones and right next to the Olympic stadium. Affordable and offering simple payment methods. Low down payment and simple loan application. Investment area is on the daily raise. Unique design plans developed by the cooperation with a foreign firm. Walking distance to the central business district, popular shopping destinations, schools, and hospitals.